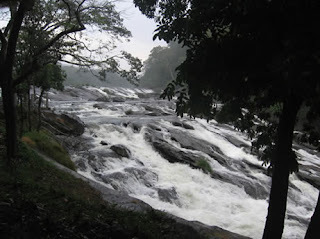 Athirappally Waterfalls is located around 80 kms from Cochin at the entrance to the Sholayar ranges. 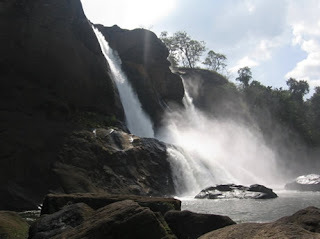 The Athirapally waterfall joins the Chalakkudy River after plummeting a drop of over 80 feet. The Vazhachal waterfall is a scenic and popular waterfall also on the edge of the Sholayar forest range in Kerala. The misty waters cascade down the rocky terrain with the thick green forest in the backdrop. This is more of a layered waterfall cascading horizontally. 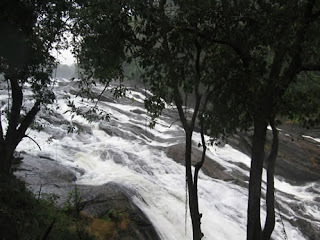 Both thes waterfalls are a part of the Chalakudy river and are around 5 km apart on the road to Valparai Tea estate. The forests area around Athirappally and Vazachal have been found to be characterised by the presence of typical riparian species of plants, in addition to evergreen and semi-evergreen species. The Chalakudy River is known for its bio-diversity and has around 85 species of fresh water fishes. We spotted some fishes in the shallow waters of Athirappally. 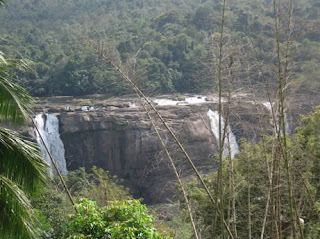 To the east of Athirappally is the enchanting but lesser known Charpa falls which plunges on to the road during monsoon. The Kerala State Electricity Board has plans to build a 23m high dam across the Chalakudy river ar vazachal, 5.5 kms upstreasm from Athirapally. This project will issue a death warrant of the water falls, the riparian forets and the rich flora and fauna of this region. The Chalakudy Protection Forum has set up Satyagraha Pandals to convey this news to the nature lovers and people visiting the falls.